To an outsider, the landscape that surrounds Alhalkere, north of Alice Springs, is a wonder of surrealist proportions. Colours continually shift with the movement of the sun and rare rainstorms batter and flood the surroundings, leading to a brief proliferation of flowering plant life. It is harsh and beautiful in equal measure and these extremes are captured with exuberance in the works of Emily Kame Kngwarreye. Not unlike Rover Thomas and Paddy Bedford, Kngwarreye’s wildly original approach to her canvases stood out. Almost purely expressionistic to outsiders, she in fact captured themes and stories that had filtered through generations of ceremony and legend for the people of the Anmatyerr language group. 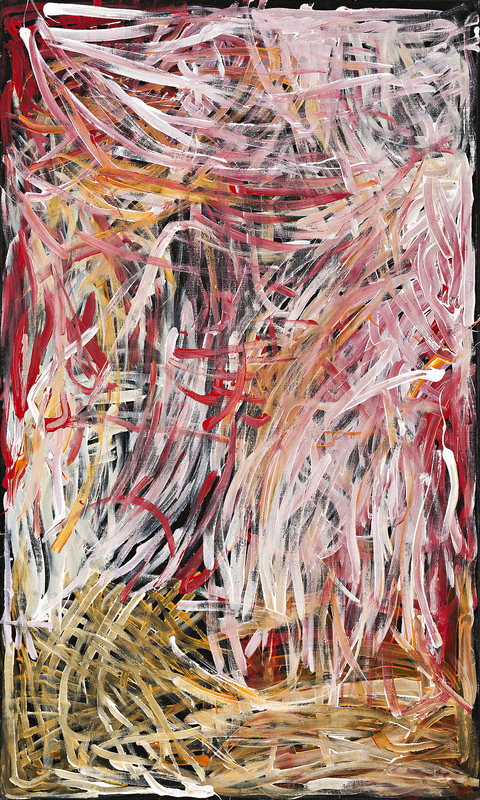 Kame Colour XII is a quintessential Kngwarreye work. Painted during the final year of her life, it encapsulates all the hallmarks of her best work in the hints of fire, rain, spinifex and nightfall. For an elderly lady she painted with the energy and enthusiasm of a youth, with brushstrokes arguably evoking the work of Jackson Pollock at the height of his powers. But for all her fame as a painter Kngwarreye did not begin painting until she was 80 years old. Her creative career began as a founding member of the Utopia Women’s Batik Group, which began in 1977, and significantly, her painting retains elements of her early batik work. The Holmes à Court Collection had began sponsoring similar projects, which led to the Utopia artists becoming nationally and internationally renowned. In 1997, Kngwarreye represented Australia in the Venice Biennale, and the Queensland Art Gallery also staged a major retrospective that travelled throughout Australia. In 2011, a second major survey travelled from the National Museum in Canberra to Osaka and Tokyo.